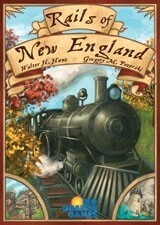 New England Rails is a business game set in 19th century New England for two to five players. Each player takes on the role of a would-be business tycoon seeking to increase profits by expanding business holdings and connecting them by railroad to major cities. Players can make decisions to improve their own holdings, and can directly affect each other by the use of Action Cards. They may trade and buy business, as well obtain Special Routes, Mail Contracts and State Subsidies. The businessman who has the most money by the end is the winner!